Wilks, Linabury, and Schroder triumph over Watanabe, Nakamura, and Ikawa to become the Grand Prix Sydney Champions for 2017! 284 teams enter, 1 team leaves, and that team is Jim Wilks, Simon Linabury, and Ivan Schroder, all from Canberra, ACT, Australia's Capital Territory. 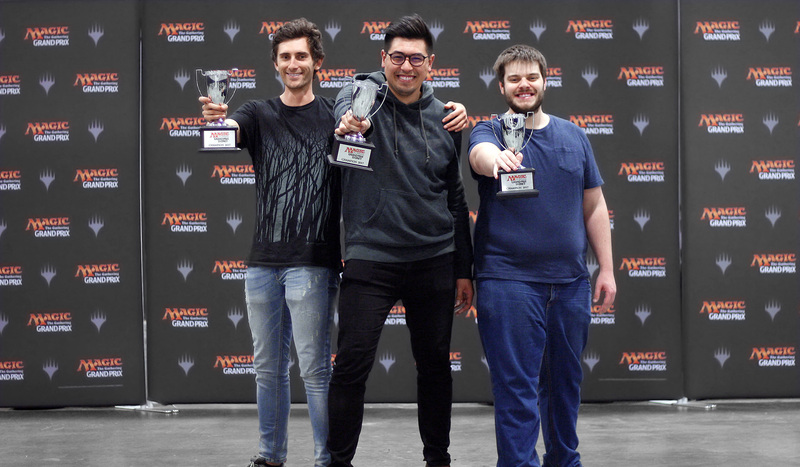 They breezed through New Zealand's Danny Liao, Jing-Wei Zheng, and Brandon Wise in the Top 4 before coming up against Hall of Famer Yuuya Watanabe in the Finals, along with his friends Hajime Nakamura and Yoshihiko Ikawa. Neither team were especially confident in the decks they had drafted in the Finals, but the Australians triumphed over the Japanese 2 matches to 1 to become the Grand Prix Sydney Champions for 2017, and keep the first ever Australian Team Grand Prix trophies on home soil. Also making the Top 8 were Jarron Puszet, Dominic Z, and Kyle Eyre from Melbourne. Missing the cut but on the same number of points were Matthew Anderson, David Mines, and Prads Pathirana, followed by Akito Shinoda, Katsuhisa Saeki, and Masahiko Shimada, and finally Australia's finest sons, Isaac Egan, Dan Unwin, and Jeremy Neeman. Helping validate Team Sealed as a truly skilful format, right behind this lot were Lee Shi Tian, Tomoharu Saito, and Jeremy Dezani, and Jason Chung, Zen Takahashi, and William Poor. Day 1 of Grand Prix Sydney has come to a close with 284 teams being cut down to just 62. Those 62 teams will return tomorrow and build their Amonkhet Team Sealed Decks anew as they continue their trek to the Top 4 playoffs. Leading the field as we forge ahead into Sunday are Jarron Puszet, Dominic Z, and Karl Eyre with 25 points. Following closely behind on 24 points are three teams: the Keedle family (Warren, Dante, and Aramis); Danny Liao, Jing-Wei Zheng, and Brandon Wise; and Jason "Amaz" Chan, Aziz Riphat, and Justin Robb. Other notable teams making the cut to Day 2 are: Kentaro Yamamoto, Hiroaki Kitahara, and Ken Yukuhiro; Matthew Anderson, David Mines, and Prads Pathirana; Yuuya Watanabe, Hajime Nakamura, and Yoshihiko Ikawa; Lee Shi Tian, Tomoharu Saito, and Jeremy Dezani; and Isaac Egan, Dan Unwin, and Jeremy Neeman. Some teams are fighting for glory, and others for much-needed Pro Points. We'll continue to follow the action tomorrow as we celebrate Australia's first ever Team Grand Prix and see who makes the climb to the Top 4! The hashtag for Grand Prix Sydney is #GPSydney. Join the conversation!